About this time last year I wrote raw words about what it’s like having 10 children with the possibility of more. You made it close to your favorite post, sharing it over 10,000 times on facebook alone. And this year, I get to feel those words, not just in my heart, but in my body by a little kicking fellow we will welcome into the world next year. People don’t ask many questions anymore, not after you’ve had 10. But I know they’re there. They were once my questions to another mother. “Why?” I truly thought it was odd, as many people do, since our society has set a norm for family size. But my heart changed the way it felt about children along the way. I see them differently. I see motherhood differently. There are no bounds to that love, not even the ones attempted by snide comments or telling glares. And as the Lord has consistently provided for our every need, and as my health has thrived, (I think because of the good stuff in pregnancy and nursing hormones), I can find no reason to purposely stop having the last of my children. Yes, it flies in the face of “normal.” But normal isn’t really what we’re called to. My child-bearing years are coming to an end, and if I can love one more baby, enjoy one more unique person that adds just a little more depth to our family, raise one more soldier for the glory of God, be a vessel to usher one more saint into the Kingdom, far be it from me to try to escape that task. Some see a spaghetti-smeared baby; I see a whole new generation. Do you just love that?? It’s when I feel so yucky (helplessness is a yucky feeling) that the Lord is best able to work in my life and the life of my family. I love the way our Father uses such weakness and foolishness to confound the world. 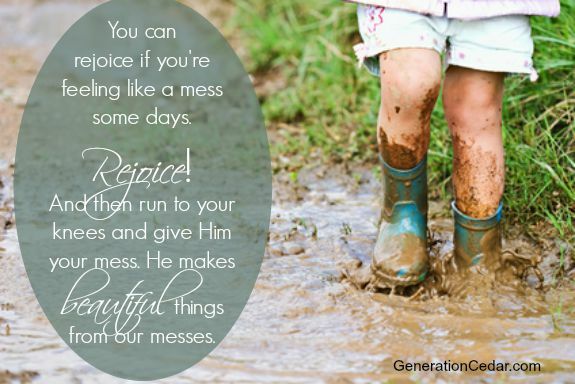 You can rejoice if you’re feeling like a mess some days. Rejoice! And then run to your knees and give Him your mess. He makes beautiful things from our messes. Amen! How can any woman ever regret having chosen motherhood? Can’t! It is what we were made for. Only women can be those vessels to usher in an army of saints. And what a privilege! Thank you Kelly. And may the Lord make this pregnancy, this ushering in of a new life a blessed time for you and your family. I have 8 children, and my bearing years are past. I miss them, but it is a new era for me and I am called to move on. There is work to be done in finishing what He has begun. And as you know, we’re not raising children. We’re raising a mighty army of ambassador-saints, who will be with us praising the Lord in Heaven forever, and laboring in Christ to make the Gospel known here on earth. CONGRATULATIONS!!!! I pray all goes well for you and your new little one. Thank you also for a good post. I am 46 years old and we just found out that we are expecting our 12th baby. While my husband and I and all of our other children are very excited, I am not looking forward to telling extended family or friends. To add to that my second oldest daughter is also expecting her first baby. I give thanks to God everyday for these blessings he is adding to our family and I try very hard to let what everyone else thinks fall away. But boy sometimes it is just very hard….and sad. I know that with God I can do this and I will do this. Praise God for all these new little people he is bringing into the world. Congratulations!!!!! What a blessing from the Lord!!!! Yay, Kelly! I’m so happy to hear that good news! God is good! CONGRATULATIONS! May the Lord keep His hand upon you and this wee baby as you progress in your pregnancy! How exciting and wonderful! I only wish all mothers saw motherhood in such a Biblical way. Thank you for being a light in the darkness! Blessings to you and your family. When are you due? Congratulations! I wish people could see the blessing that children truly are. Just yesterday, I had a stranger tell me that I shouldn’t have had 11 kids but a more “reasonable” amount. It really made my heart hurt. I know this is a little off-topic (although it does have to do with people’s ideas about children), but I’m desperate for advice on how to deal with a situation with our 15 yr. old son’s former 1st grade teacher who goes to our church. I absolutely love this woman, however, she has very different ideas about homeschooling than we do. She comes from a family of public school teachers. She and her husband are retired teachers, while their daughter and niece currently teach in our school district now. Her initial reaction upon us pulling our kids out of school years ago was to ask if it was because I didn’t have enough help at home. Other than that, she’s been mostly silent about our choice- until yesterday. She approached me at church yesterday and told me that I should sign our son (the 15 yr. old) up for the charter school next year because it’s a shame that he’s not in high school. He must have been telling her that he doesn’t want to go to school because he doesn’t want to be bullied. She told him that it was wrong for someone to tell him that that would happen and we were wrong to say it. Now, it’s important to say that, despite his age, he has been diagnosed as constitutionally delayed and is only 4’8 and 65 lbs. So our concerns about his safety are not unreasonable. Even his endocrinologist agrees that homeschooling is in his best interest- not to mention the fact that our school district is plagued with sexual assaults- even in the elementary schools and drugs. I reiterated that it is our responsibility to keep him safe and politely listened to her talk about the new charter school. Do you have any advice on what I could say to her that would not offend her with her teaching history? I’m afraid that she’s going to start in with my other kids, as well. Others might answer this differently, but for me, I believe in the power of persuasion and I do my best communicating through the written word. It I were in your shoes, I’d write out a thoughtful response to your personal reasons, also letting her know you find it insulting that she is asserting her opinions to your children, essentially usurping your authority. I would print articles that address the reasons you are homeschooling and in a sense, try to win her over to your position. If not that, at least help her understand that you have made careful, thoughtful decisions about what you feel is best for your children. Thank you. That’s a great idea. I may even print out a few of your posts (if you don’t mind) because your views on both the true motives behind compulsory schooling and our responsibility as Christians to educate our own children reflect my own exactly. Thanks again for taking the time to respond. And I was wondering if you were expecting again when you wrote how sick you’d been a few weeks ago! My “opinion” may not matter all that much since we do not know each other, yet we are sisters in the Lord. Does anything more need to be said other than you believe God has called you to keep your children at home for the time being? I’m not sure that it is our job to win people over to our side (in regards to a personal calling to homeschool), but rather to be loving and gracious in our response – giving them some food for thought. I’m sure this lady is simply curious as to your keeping your children home (as are many who may not agree wholeheartedly with homeschooling). Your opinion certainly does matter, and I appreciate it. While I don’t plan on confronting her about it, I would like to be prepared in case she brings it up again. Unfortunately, sometimes I get a bit flustered when being confronted over something, so I’m thinking of just carrying a few articles in my purse, and, if need be, pulling them out and telling her, “Here. This is why I homeschool. It says it better than I can.” Thank you so much for the advice. Have a blessed day! I love this post so much! Thank you, and many congratulations!!! Congratulations! I just found your blog not long ago and have been really enjoying reading through your posts. I bought your Motherhood book and have started reading that as well. Keep writing! You are such an encouragement! I have 5 children and an currently recovering from a miscarriage. Having lost a few babies that way, it makes me very, very thankful for the 5 I have, with hopefully more to come. May you know God’s blessing and peace as you carry this new little one. Congratulations, Kelly! What wonderful news! Congratulations! What exciting news! Also thank you for, in addition to raising those precious children, encouraging me to raise mine well. Congratulations Kelly! I am so excited to hear about this new blessing!Thank you for being such an encouragement to those of us who leave our family size in God’s hands, despite the criticism and “conventional wisdom” so many others are willing to heap upon us. I am due in January with #6; this will be my 4th baby post-cancer after we were told we’d never be able to have more children because of the treatments I received. Despite knowing my story and knowing how God has brought such abundant life from my broken and diseased body, I still hear comments concerning us “being done”(none of which have anything to do with ny health, by the way). I just don’t understand it, and at times it’s very discouraging. Thank you for reminding me why we do this and helping me to keep my eyes on what’s important. How timely! I just shared the wonderful news with my mother with much trepidation that we are expecting our 8th child at 46 yrs old. Her response was quite painful but she does not know the Lord and is not able to see the blessing of children-only the burden. My heart grieves for her. Thank you for the encouragement!!! Yay! So glad to hear things are going well, Kelly. BTW. I can’t forget what I was reading, but in some news article a certain woman was described as being a “full -time parent.” I thought that was pretty neat, although I can imagine it will be highly objectionable to others.. I so appreciate all your well wishes and kind words. I wish I had time to answer each of you. Oh what joy!! Congratulations to you and your husband and family, Kelly!! Dear Kelly, I was studying 2 Corinthians 12 this morning. 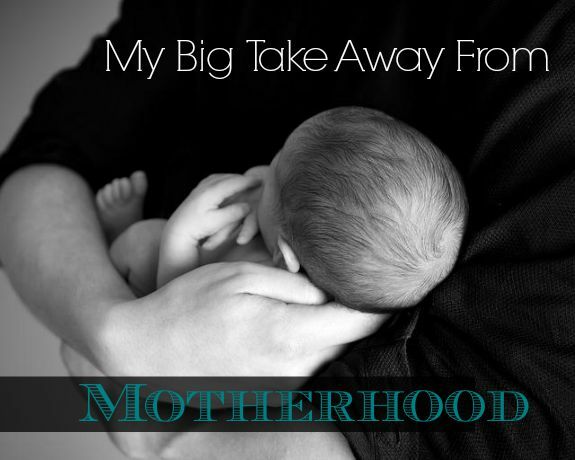 I often think “what is wrong with me that I can’t handle the pressures of motherhood” like others appear to do. I feel comforted by your honest admission of the gut-wrenching responsibility that it carries. That is the most difficult part of mothering for me, being constantly confronted with my weaknesses. There is no way for me to put confidence in myself because I am reminded, moment by moment, of my desperate need for God’s grace. This in itself is God’s grace! My DH does not see things the same way. He sees the weakness that parenting brings out in us and thinks this is the problem. Therefore, he is not willing to have anymore children. It is out of my control, but I trust God’s sovereignty. Prayers for you, dear Natalie. You are right, Natalie (our desperate need for God’s grace) and I’m sorry for the hard providence you are facing. Thank you both :). By the way, congratulations Kelly! Great takeaway! God affirms that truth for me daily as he draws me to lean on him, and yet I still need reminding. Thank you, Smitti. And I wanted to double check and see if you got my reply to your email? Wonderful news!!! I don’t want to be a ‘groupie’, but I feel personally involved with you even though you don’t know me from Eve, so I guess I am. I have hoped it would be God’s will for you to have another child. I am so happy for y’all. LOL! Well, I don’t think of you as a groupie, but a friend. Thank you! When I started reading the post and I figured out that you were announcing that you are pregnant my eyes lit up and my mouth opened in excited astonishment! I immediately said a prayer for the perfect health of you and your precious baby. I’m so excited for you all! Congratulations, Kelly! So excited for you and your family! How are you feeling? Not too bad, Candace. I’ve had a few unpleasant things–6 week-long (so far) sinus infection even after a round of antibiotics, but overall, I feel well. Thank you. Oh my, such a happy day! I pulled up your blog today and was met with such delight. Can I tell you something? We have a large age gap between our children because we thought we were *done*. Well, as blogs became popular, I started really devouring them and following several(yours being one of them). They really helped to change my heart on the matter. We do not have a Christian family and really have felt alone for many years. I’ve *learned* how to mother, how to be a Christian wife, homeschooling, etc. from blogs like yours. And, we opened our hearts to more children because of people like you. Seriously. We have two more children and are hoping for more. You really do have a positive impact on so many. Blessings to you Kelly. Thank you! Praise God for all your children. Congratulations, Kelly! My husband and I are on month 3 of trying for our first baby ever. Your blog has taught me so much about God’s grace and provision. Thank you for that. So happy for your family! Congratulations. I hope you don’t mind me asking but do any of your children have special needs.? I have three daughters, one with special needs . I spend a lot of time at the doctors and therapy sessions. My children go to public school. I would never have time to stay home and homeschool. Three is my limit and I have no regrets of not having any more children. I also struggle with depression and anxiety and although I pray and trust in God to get me through each day and be the best mom I can, I just can’t imagine even one more. Everyone is different and not everyone has the health, finances or resources to have 10 plus kids. It takes a certain personality and strength I just do not possess. I love and cherish my three daughters, but I have no regrets of not having anymore. Happy for you though, it does seem to be your calling, having a large family but most can’t . A lot of people have small homes too. I wouldn’t even know where to put 10 kids. BUT…each couple certainly has to assess their situation and I can’t speak for you. But I can say I disagree with some of your thoughts here. Large families are not necessarily for “special people” and I know that because I am most certainly not special. I too, struggle with anxiety and depression both, making me not a great candidate for a large family, and yet I see the Lord using my children to work on the rough areas in my life in a way I don’t think He could use anything else. Financially, we have quite a story (you can search on the blog to read some of it) but suffice it to say we have never been in the financial position to have a large family, but for God’s miraculous care over us. So all that to say, there’s nothing about our circumstance that is special or convenient or conducive to a large family. We have just trusted God, day by day, to meet our needs as they came. And He has done so remarkably. 5 kids and a miscarriage in 7 years. My husband and I welcome more children but I am always nervous to hear others responses and especially on rough days when the house is trashed and the kids aren’t behaving…I wonder myself if I’m the crazy one. Ah, you’re welcome, Laci! The days will get better, just enjoy the little things. Congratulations Kelly. You are living my dream life. I had 3 children and one adopted. Now I have 18 grandchildren. One is a lovely great granddaughter. Emily and John’s. When my children were young homeschooling was rare. I wish I would have homeschooled. My daughter’s teachers would ridicule me to them. They said things like your mom is out of touch with reality, old fashioned and eccentric. I was a homemaker, wife and mom for 48 years. I still love homemaking and I have a group online that are mostly younger women. Thank you Kelly for your kind support. I miss our homemakers group there. If I had a chance to live anywhere it would be near you again. There are many homemakers in that area. You are blessed indeed.